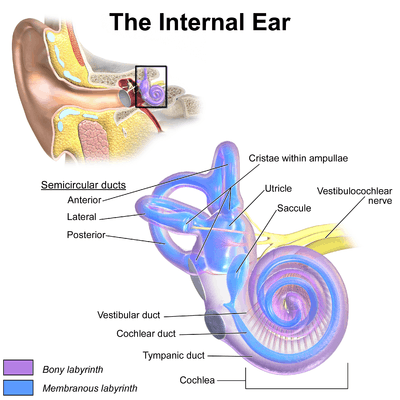 The semicircular canals are a component of the bony labyrinth. At one end of each of the semicircular canals is a dilated sac called an osseous ampulla which is more than twice the diameter of the canal. Each ampulla contains an ampulla crest, the crista ampullaris which consists of a thick gelatinous cap called a cupula and many hair cells. 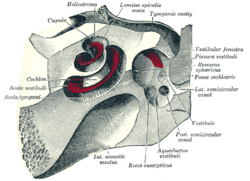 The anterior and posterior semicircular canals are oriented vertically at right angles to each other. The lateral semicircular canal is about a 30-degree angle from the horizontal plane. The orientations of the canals cause a different canal to be stimulated by movement of the head in different planes. The horizontal canal detects angular acceleration of the head when the head is turned and the superior and posterior canals detect vertical head movements when the head is moved up or down. 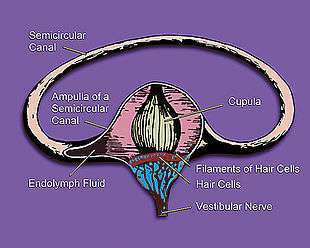 When the head changes position, the endolymph in the canals lags behind due to inertia and this acts on the cupula which bends the cilia of the hair cells. The stimulation of the hair cells sends the message to the brain that acceleration is taking place. The ampullae open into the vestibule by five orifices, one of the apertures being common to two of the canals. It is 15 to 20 mm in length, is vertical in direction, and is placed transversely to the long axis of the petrous part of the temporal bone, on the anterior surface of which its arch forms a round projection. As part of the vestibular system it detects rotation of the head around a rostral-caudal (anterior-posterior) axis. It describes about two-thirds of a circle. 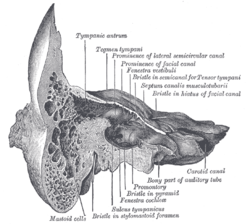 Its lateral extremity is ampullated, and opens into the upper part of the vestibule; the opposite end joins with the upper part of the posterior canal to form the crus commune, which opens into the upper and medial part of the vestibule. The posterior semicircular canal is a part of the vestibular system detects rotation of the head around a rostral-caudal (anterior-posterior) axis, or in other words rotation in the coronal plane. This occurs, for example, when you move your head to touch your shoulders, or when doing a cartwheel. It is directed superiorly, as per its nomenclature, and posteriorly, nearly parallel to the posterior surface of the petrous bone. The vestibular canaliculus is immediately medial to it. It is part of the bony labyrinth and is used by the vestibular system to detect rotations of the head in the sagittal plane. It is the longest of the three canals, measuring from 18 to 22 mm. Its lower or ampullated end opens into the lower and back part of the vestibule, its upper into the crus commune. Findings from a 2009 study demonstrated a critical late role for bmp2b in the morphogenesis of semicircular canals in the zebrafish inner ear. It is suspected that the role of bmp2 in semicircular canal duct outgrowth is likely to be conserved between different vertebrate species. Each canal is filled with a fluid called endolymph and contains motion sensors within the fluids. At the base of each canal, the bony region of the canal is enlarged which opens into the utricle and has a dilated sac at one end called the osseous ampullae. Within the ampulla is a mound of hair cells and supporting cells called crista ampullaris. These hair cells have many cytoplasmic projections on the apical surface called stereocilia which are embedded in a gelatinous structure called the cupula. As the head rotates the duct moves but the endolymph lags behind owing to inertia. This deflects the cupula and bends the stereocilia within. The bending of these stereocilia alters an electric signal that is transmitted to the brain. Within approximately 10 seconds of achieving constant motion, the endolymph catches up with the movement of the duct and the cupula is no longer affected, stopping the sensation of acceleration. The specific gravity of the cupula is comparable to that of the surrounding endolymph. Consequently, the cupula is not displaced by gravity, unlike the otolithic membranes of the utricle and saccule. As with macular hair cells, hair cells of the crista ampullaris will depolarise when the stereocilia deflect towards the kinocilium. Deflection in the opposite direction results in hyperpolarisation and inhibition. In the horizontal canal, ampullopetal flow is necessary for hair-cell stimulation, whereas ampullofugal flow is necessary in the anterior and posterior canals. This adjustment period is in part the cause of an illusion known as "the leans" often experienced by pilots. As a pilot enters a turn, hair cells in the semicircular canals are stimulated, telling the brain that the aircraft, and the pilot, are no longer moving in a straight line but rather making a banked turn. If the pilot were to sustain a constant rate turn, the endolymph would eventually catch up with the ducts and cease to deflect the cupula. The pilot would no longer feel as if the aircraft was in a turn. As the pilot exits the turn, the semicircular canals are stimulated to make the pilot think that they are now turning in the opposite direction rather than flying straight and level. In response to this, the pilot will often lean in the direction of the original turn in an attempt to compensate for this illusion. A more serious form of this is called a graveyard spiral. Rather than the pilot leaning in the direction of the original turn, they may actually reenter the turn. As the endolymph stabilizes, the semicircular canals stop registering the gradual turn and the aircraft slowly loses altitude until impacting with the ground. 1 2 Saladin, Kenneth S. (2012). Anatomy and Physiology: The Unity of Form and Function. New York: McGraw Hill. pp. 607–8. ISBN 978-0-07-337825-1. ↑ Spoor, Fred; Garland, Theodore; Krovitz, Gail; Ryan, Timothy M.; Silcox, Mary T.; Walker, Alan (2007). "The primate semicircular canal system and locomotion". Proceedings of the National Academy of Sciences. 104 (26): 10808–12. Bibcode:2007PNAS..10410808S. doi:10.1073/pnas.0704250104. JSTOR 25436020. PMC 1892787 . PMID 17576932. ↑ Hammond, Katherine L.; Loynes, Helen E.; Mowbray, Catriona; Runke, Greg; Hammerschmidt, Matthias; Mullins, Mary C.; Hildreth, Victoria; Chaudhry, Bill; Whitfield, Tanya T. (2009). Hendricks, Michael, ed. "A Late Role for bmp2b in the Morphogenesis of Semicircular Canal Ducts in the Zebrafish Inner Ear". PLoS ONE. 4 (2): e4368. Bibcode:2009PLoSO...4.4368H. doi:10.1371/journal.pone.0004368. PMC 2629815 . PMID 19190757. ↑ Katz, Jack; Chasin, Marshall; English, Kristina; Hood, Linda J.; Tillery, Kim L. (2015). Handbook of Clinical Audiology (7 ed.). Philadelphia, PA: Wolters Kluwer. pp. 383–385. ISBN 978-1-4511-9163-9. ↑ Antunano, Melchor J. "FAA: Medical Facts for Pilots" (PDF). Federal Aviation Administration. Retrieved 8 Dec 2011.